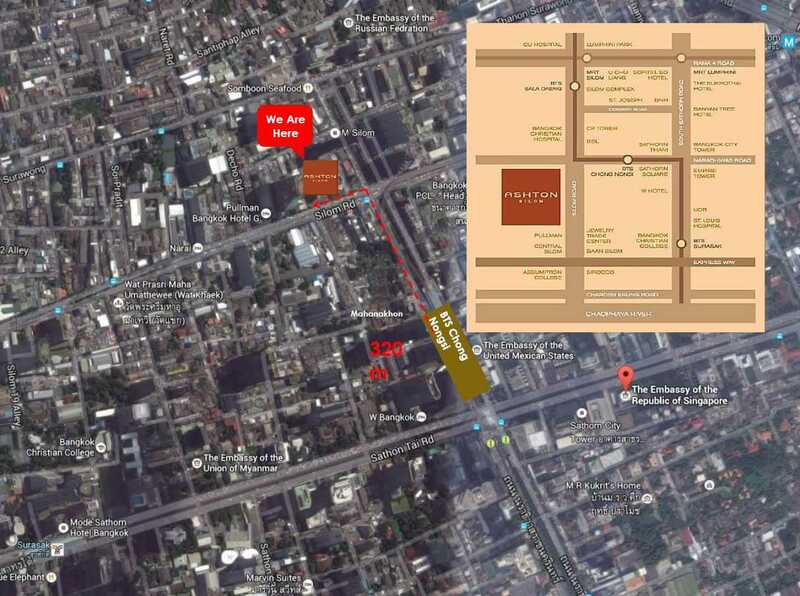 FREEHOLD Nestled in the heart of Bangkok’s CBD Silom Districtin “Wall Street” alike area. Ultra LUXURY Condominium with Futuristic Design & SKY Facilities. 1st Residential project along Silom Road in past 15 years. Corner design for almost all unit types (except Type F), to maximize the best view. Jointly Developed by Thailand’s Number 1 Mass Transit Real Estate Developer, ANANDA DEVELOPMENT and Japan’s Reknowned Real Estate Corporation, MITSUI FUDOSAN, ASHTON SILOM seeks to redefine ultimate luxury living. A 48-storey skyscraper, boasting breathtaking panoramic views of Bangkok City, ASHTON SILOM comprises only 428 exclusive residences available in 1-bedroom (31 sq.m to 48 sq.m) and 2-bedroom (71 sq.m to 86 sq.m) format. Utilising a unique and innovative vertical interlocking architectural design means a superb and rare 3.6-metre* tall floor-to-window ceiling height for selected 2-bedroom residences. Our 1-bedroom residences also boasts superb floor-to-window ceiling heights of up to 3-metres. Such ultra generous living volumes coupled with maximum window spaces is a very rare feature even in the most top-end luxurious developments in Bangkok, Thailand. Top quality finishes and fittings (including imported materials) befitting a ultimate luxury residential development such as ASHTON SILOM is only a given. What more, this ultra luxurious interior design concept is applied consistently throughout the entire development, right from the grand lobby entrance, the communal & recreational facilities, and to your very own private abode. ASHTON SILOM boasts a comprehensive list of communal and recreational facilities such as the alfresco living plaza or lobby lounge, garden and sunken seating on the ground floor; the swimming pool, children’s pool, jacuzzi, fitness room, private fitness room, steam rooms, sauna room, massage room, library, cinema room, business lounge, and the 360-degree floating sky deck on the 34th and 35th floor; and a social club & wine bar, and outdoor lounge with garden on the 46th and 48th floors. Words simply cannot describe how ASHTON SILOM will set the new benchmark in ultimate luxury living. Offering 5-Star in-residence services such as free shuttle service to the nearest BTS Chong Nonsi Station, butler services (dining, catering, housekeeping, courier services, etc. ), residence manager on-call service (reception, travel management, etc. ), spa service / therapist arrangement, maintenance services and valet parking services, ASHTON SILOM will be THE residence for the connoisseur who demands only the best. 3 sations to Siam Paragon, Siam Center and Central World. ASHTON SILOM is located in the heart of Bangkok’s prime CBD area of Silom – boasting the highest land appraisal price across Bangkok, Thailand. Silom (constructed in 1851) or the “Wall Street” of Bangkok is home to most of Thailand’s major and international multi-corporations, as well as the finest restaurants the city has to offer, including Michelin-Starred establishments – Silom NEVER sleeps. Silom is therefore home to the who’s who and high net worth individuals (HNWIs) and families of Thailand and senior executive expats. What more, in the last 15 years or so, there has not been a luxury condominium launched on the main Silom Road. Cultural establishments such as Alliance Francaise, Goethe-Institut Thailand, Sathorn Soi 1.